7 Casualty Clearing Station. 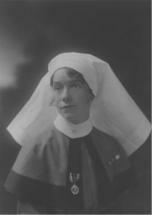 At Noeux-les-Mines, Acting Sister Maud Alice Abraham, Civil Hospital Reserve. For conspicuous bravery and devotion to duty, in that on the morning of Sept. 19th 1917 during very active enemy shelling she continued in her work as operating theatre Sister wit the greatest coolness and courage, though shells were bursting very near and pieces were frequently striking the hospital. On this day approx. 200 shells fell near the hospital between the hours of 1.30am and 1.30pm. It was absolutely necessary for surgical operations to be performed, and Miss Abraham's consistent courage and devotion to duty were not only of great advantage to the wounded but an example to and the admiration of all who worked with her. This is only one of the many occasions when shells and bombs have fallen near this hospital and whenever acts of courage have been called for she has behaved in a manner beyond the highest words of praise. At Bethune on the 7th August 1916 she was present in the operation theatre when it was wrecked by the close explosion of a 15 inch shell which slightly wounded her. She remained at work and displayed great courage in continuing to attend to patients for five hours. 20 Casualty Clearing Station. On the evening of June 3rd, 1917, at Boisleux these three members of the Nursing Service remained on duty in the shrapnel swept hospital attending to the severely wounded and helpless cases, and wound not leave their dangerous position until the patients were in a place of safety. At Bailleul Ambulance Siding. 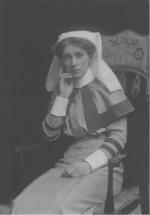 This lady was on duty on the night of the 6/7th July 1917, at No.11 Casualty Clearing Station. For about three hours bombs were repeatedly dropped in the immediate vicinity of, and eventually into the Casualty Clearing Station, which was under canvas. There were some 250 patients in the Hospital at the time, 27 were killed and 68 wounded amongst the patients and personnel as a result of seven bombs dropped on the Hospital. Throughout she continued her duties amongst the patients helping to calm them and attending to those wounded in the bombardment. She showed most remarkable coolness and devotion to duty, and gave a splendid example under very trying circumstances. 7 CCS. At Noeux-les-Mines. For conspicuous bravery and devotion to duty in that during the night of September 12/13th 1917, during very heavy enemy shelling, when pieces of shell were striking the hospital, and one of the personnel was wounded she carried out her duties with the greatest courage and coolness. Her bravery, cheerfulness, and devotion to duty during this horrible night were of the greatest advantage. when the darkness and helplessness of the wounded made many of them seriously alarmed. Her presence of mind and absence of fear gave a much needed confidence to the patients. This is only one of the many dangerous occasions when Miss Boyd has acted up to the highest traditions of the Nursing Service. For exceptional courage and devotion to duty during a hostile Air Raid, when bombs were dropped on the Hospital. One of the bombs wrecked the hut in which she was on duty, and, with the greatest coolness, she attended to all the patients in the Ward, though she herself was wounded. 7 Casualty Clearing Station. At Noeux-les-Mines. 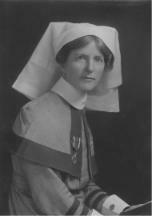 For conspicuous bravery and devotion to duty, in that on the afternoon of September 30th, 1917, when two people were killed and three wounded just outside the main wards, though shelling still continued and pieces of shell occasionally struck the building in which she was working, Miss Broome with perfect coolness and courage continued to attend and encourage the wounded regardless of her own danger. This is only one of the many occasions when shells and bombs have fallen in the neighbourhood of this hospital and the consistent manner in which her coolness, bravery and devotion to duty have been displayed, has been of the utmost service in the care of the wounded and an example to all with whom she has worked. For bravery and devotion to duty during an hostile bombing raid when in company with the Matron who was severely wounded and a Sister who was killed. She remained with them and tended them till help arrived. Subsequently she returned to the CCS and worked devotedly for many hours, under conditions of great danger. 47 Casualty Clearing Station. At Dozinghem, at 9.15 p.m., August 20th 1917, during a Bomb Raid in which there were 68 casualties, including 14 deaths, this Lady showed remarkable coolness and gallantry under the most trying circumstances. Although she had been on duty in the Theatre for 13 hours, she was foremost in attending to the injured, and when work could be resumed, took her place at the table at which she remained throughout the night. As a Theatre Sister to this Clearing Station very considerable responsibility rested upon her. By her action and example she materially assisted in maintaining order and discipline. At Edgehill, during the night of the 14th - 15th November 1916, enemy aeroplanes dropped three bombs on the Casualty Clearing Station, killing two men and wounding 14. Miss Carruthers who was on duty in a tent near which one of the bombs exploded, displayed great courage and disregard of danger in continuing to attend to the patients although she was herself wounded by a fragment of the bomb. For conspicuous bravery and devotion to duty during an enemy air raid. She attended to, and provided for the safety of, helpless patients. She was assisting Staff Nurse Dewar and the latter was fatally wounded, and although the tent was full of smoke and acrid fumes, and she had been struck by a fragment of bomb, she attended to Staff Nurse Dewar and also to the case of a helpless patient. For gallantry and devotion to duty during an enemy air raid, when her ward being destroyed by a bomb and herself wounded, she insisted on remaining at her post and attending to the wounded. For gallantry and devotion to duty during an enemy air raid. When the sisters' quarters were wrecked and bombs were falling, she showed a fine example, and assisted materially in controlling the situation and attending to the sisters who were wounded. For bravery and devotion to duty during an enemy air raid, when the building occupied by the hospital was hit by four bombs, which cut in two the ward in which Sister Guerin was on night duty. Several patients were wounded and buried in the debris of the destroyed building, but she remained on duty in her ward, displaying the greatest coolness and courage in attending to the wounded and helping to rescue the buried. At the first intimation of enemy aircraft, this Lady, instead of going to the bomb-proof shelter provided for the Nursing Sisters, at once went to the wards for serious cases to look after the patients. By the time she got to the wards bombs were falling in the vicinity, and she was on her way from the serious ward to the Officers' ward when she was struck by fragments of a bomb, which hit the ward she had just visited and wounded her in three places. For conspicuous bravery, calmness and devotion to duty in looking after the safety of the patients under her charge, even after she was wounded by a piece of bomb and bleeding profusely, during an enemy raid. One patient was killed beside this Nurse and another wounded by the same bomb. At Bethune on the 7th August 1916 she was wounded by splinters of glass caused by a shell which exploded outside the operating theatre. She remained on duty and did good work until all patients were evacuated. 32 Casualty Clearing Station: For great courage while in charge of her ward at Brandhoek on the 21st August 1917. Although the ward was twice riddled by enemy aircraft, she continued attending the patients, and by her example prevented many of them from injuring themselves. For conspicuous bravery under fire on No.27 Ambulance Train. On the night of the 10th November 1916, the train was carrying a load of 450 sick and wounded and entered Amiens as an aeroplane attack began, which lasted an hour, and during which the Anti-Aircraft guns were in hot action. Five bombs fell in the immediate neighbourhood of the train causing damage, and some patients to be thrown out of their cots. 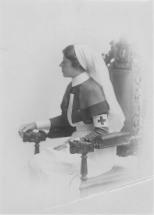 The Commanding Officer reports that this Sister, carrying a hand lamp, went about her work coolly and collectedly and cheerfully and that by her magnificent conduct she not only allayed alarm among the helpless patients and those suffering from shell shock but caused both patients and personnel to play up to the standards which she set. For her splendid behaviour and example as Sister-in-Charge in exhibiting great coolness on the 7th December 1917, at Bethune, when the town was heavily shelled all day, in attending to the patients in the wards and in the cellars. Also for continuous good service during the past year under trying times, the Town being shelled and bombed frequently. For conspicuous coolness and devotion to duty when supervising the transfer of patients from a CCS to an Ambulance Train while the locality of the CCS was being steadily shelled. She set a splendid example of calmness and composure. For bravery and devotion to duty during an enemy air raid, when four enemy bombs were dropped on the building occupied by the hospital, causing much damage to the ward in which Sister Galvin was on night duty. She remained in the ward attending to the sick, several of whom were wounded, and carried on her work as if nothing had happened. She displayed the greatest coolness and devotion to duty. For conspicuous bravery and devotion to duty during an enemy air raid. She rendered efficient first aid to a patient who was injured by a bomb and then fetched a Medical Officer. She did this although no less than fourteen bombs fell within a radius of 60-80 yards of the tent in which her patient was wounded. At Bailleul Ambulance Siding. This lady was on duty on the night of the 6/7th July 1917, at No.11 Casualty Clearing Station. For about three hours bombs were repeatedly dropped in the immediate vicinity of, and eventually into the Casualty Clearing Station which was under canvas. There were some 250 patients in the Hospital at the time, 27 were killed and 68 wounded amongst the patients and personnel as the result of seven bombs dropped on the Hospital. Throughout, she continued her duties amongst the patients, helping to calm them and tending to those wounded in the bombardment. She showed most remarkable coolness and devotion to duty, and gave a splendid example under very trying circumstances. 47 Casualty Clearing Station: At Dozinghem at 9.15 p.m., August 20th 1917, during a bomb raid in which there were 68 casualties, including 14 deaths, this Lady was on duty in the Officers' Ward and was struck by two pieces of shell in the thigh. She continued to work and reassure the patients until faint and dizzy, when she collapsed. Her action in remaining on duty though suffering considerable pain is worthy of the highest commendation for this gallant action. 35 General Hospital: On the night of 3/4th September, 1917, after being wounded in the head by an aerial bomb, came on duty in the operating theatre, and continued to work there as Theatre Sister the whole night and all the next day. No.58 General Hospital: At St. Omer during the raid by hostile aircraft on the night of September 30th - October 1st, 1917. 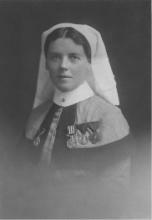 While on duty during an air-raid during which bombs were dropped on the hospital, causing casualties (killed and wounded) amongst the Sisters, patients and Medical Orderlies, by her cool, methodical and collected demeanour she inspired confidence in, and showed an outstanding example of calm fortitude to, the Nurses under her. At Bethune, on the 7th August 1916, although knocked down by the explosion of a 15 inch shell, she resumed her work until all the patients were evacuated showing exceptional courage.